Thomas Allen Holmoe is a former professional football player and coach. He is the Director of Athletics at Brigham Young University, the first to direct both men’s and women’s athletics. Holmoe was born March 7, 1960, in Los Angeles and reared in La Crescenta, California. He played both basketball and football in high school and went to BYU on a football scholarship. He was a defensive back from 1978 to 1982. He led the Western Athletic Conference in 1980 with seven interceptions and earned all-WAC honors as a senior in 1982. The team won the conference championship during each of his four years at BYU. While at BYU, Holmoe met his wife, Lori, who is a member of The Church of Jesus Christ of Latter-day Saints. He later joined the Church. Holmoe earned a bachelor’s degree in Zoology in 1983 and received his master’s degree in Athletic Administration in 1995. During the 1983 NFL Draft, Holmoe was drafted by the San Francisco 49ers in the fourth round. He played with the 49ers for seven years and won three Super Bowl rings (1984, 1988, and 1989). He retired in 1989 due to a knee injury. He later acquired a fourth Super Bowl ring with the 49ers when he was defensive backfield coach. He was a graduate assistant under LaVell Edwards from 1990 to 1991, then went to Stanford as secondary coach in 1992 and stayed for two seasons. While there, the tem became the Pac-10 co-conference champions. Holmoe went to the 49ers as defensive backfield coach for two seasons. He then joined the University of California staff as defensive coordinator and became the head coach from 1997 till 2001. He resigned after a disappointing season for the team. In 2001, he became Associate Athletics Director for Development at BYU and then was appointed Director of Athletics at BYU on March 1, 2005. He hired both football coach Bronco Mendenhall and basketball coach Dave Rose. Both coaches have achieved their teams to national prominence. 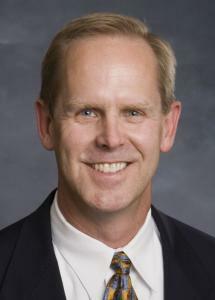 In June 2014, Holmoe was appointed to the Division I Men’s Basketball Committee. He will serve for two years, finishing Jamie Zaninovich’s term. Holmoe and his wife, Lori, have four children and live in Provo, Utah. This page was last edited on 20 September 2014, at 20:44.